So I’ve been spinning my little heart out over the last few days, but in small bursts, so the sum total of my work is about 1 spindle’s worth of single ply. In the light of enjoying my drop spindle so much lately, I thought I’d share how I learned to use it. Tutorials on YouTube are great (and I’ll link to one in particular later on) but most of them don’t really show in detail the way to get started. I learned from a great lady who teaches a class in East County San Diego (I believe she was from the East County Spinners Guild). Her method made it easy to attach the roving and get started. So that’s what I’m going to share with you. 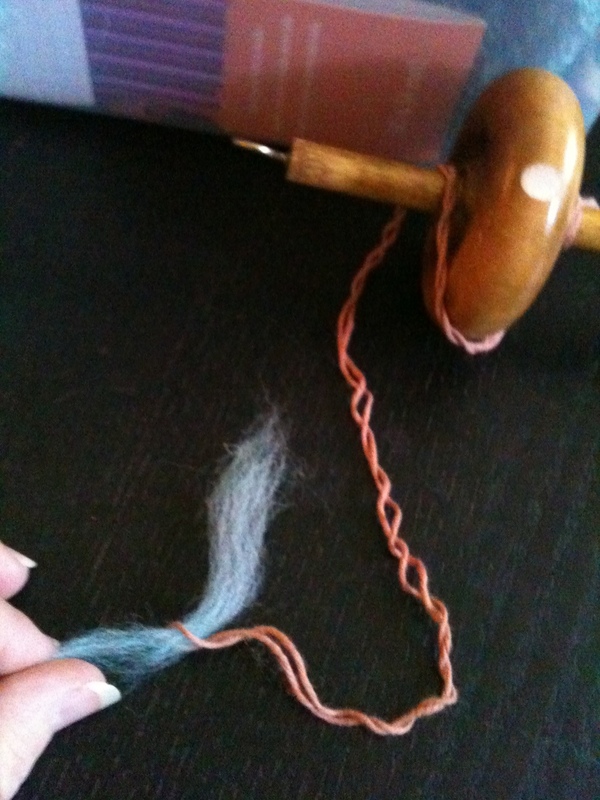 That string (thin cotton yarn will work too) that’s attached to my spindle is the first step. Make a long circle with the string and tie the two ends together. 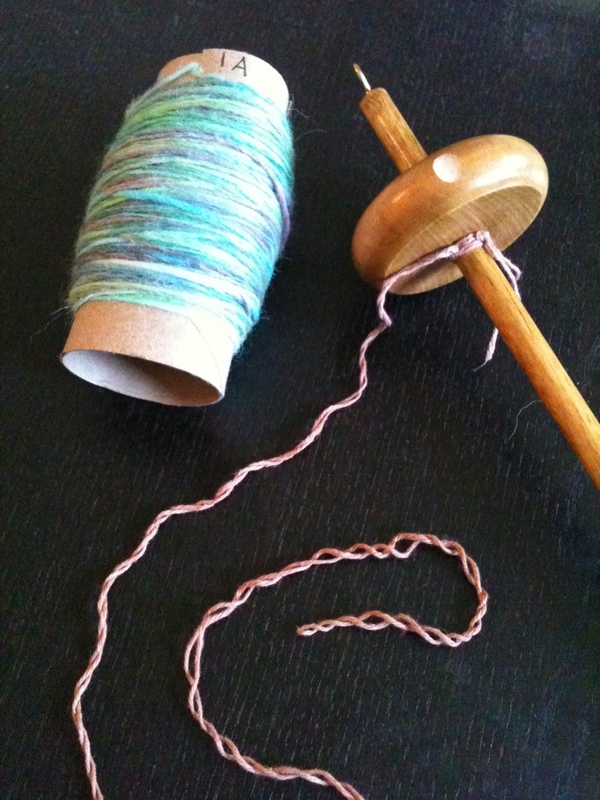 Then you’ll attach it at the knotted end to your spindle (as seen in the picture above). With your string attached, it’s time to start preparing your roving. 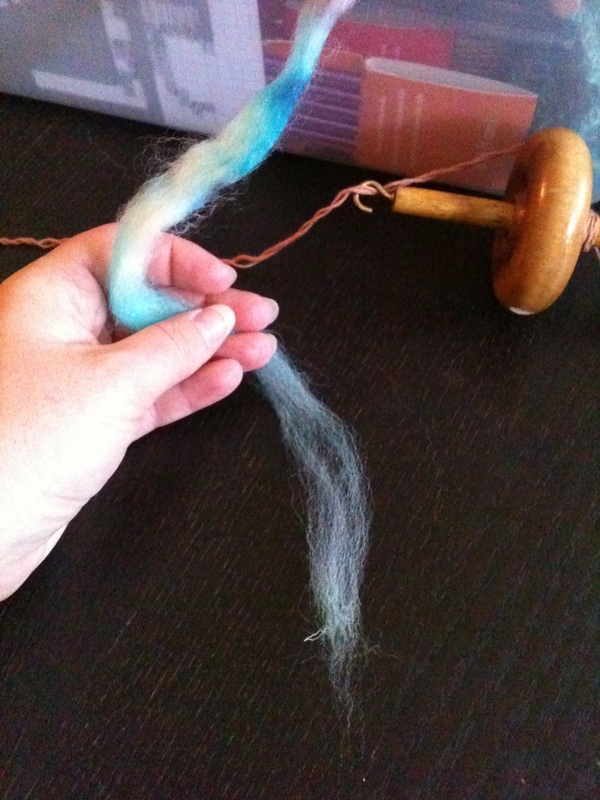 The roving I had was already pre drafted (pulled to desired thickness). Basically pull the end bit of wool away from the rest of the wool so it looks similar to the picture. Put about an inch of your roving through the loop that the string created. Fold the roving over so that it is touching itself (har). Run the spindle UP your leg, towards you. Never mind the passed out Beagle. Now it’s time to load the spin up on your spindle. 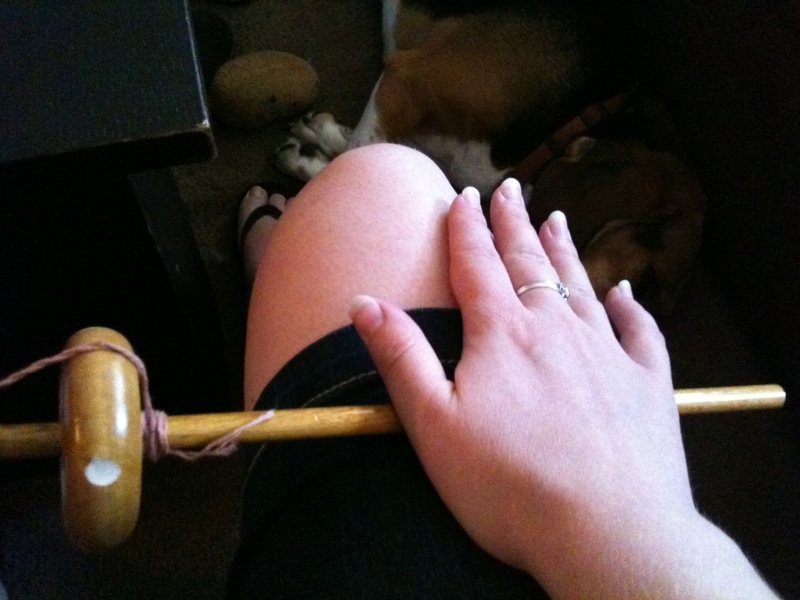 While still holding the roving in one hand (I’m right-handed, but I find it easier to work the spindle with my right and hold the roving with my left) run the spindle UP your leg, towards yourself. 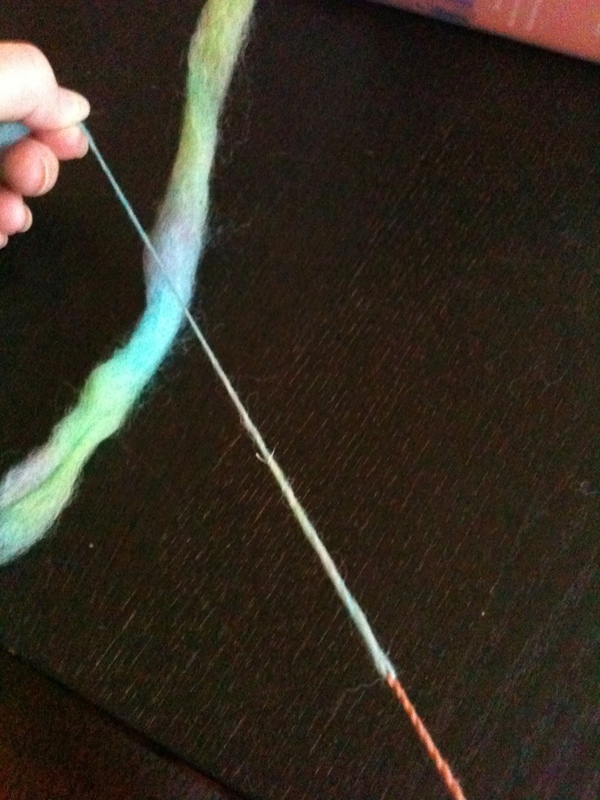 This will load the twist up on the spindle, and thus the roving/yarn. There’s some more detail (hard to show in pictures without a second person handy) on the actual spinning process on this YouTube drop spindle tutorial. I prefer to sit while I’m spinning, and use a cheater method. After I spin my spindle up my leg, I hold steady to the roving and just let the whole thing hang and spin until it almost stops. 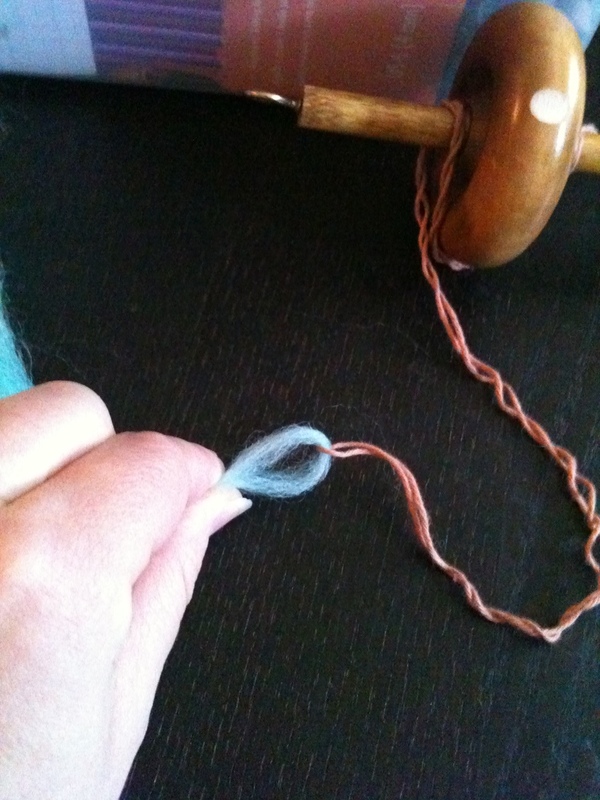 I then catch the handle of the spindle between my knees, THEN draft the roving and let the twist run up it. It just seems easier to me to concentrate on one thing at a time, but do whatever works best for you. Once you’ve let the twist run up the length of the string, and onto the roving, the part folded over itself twists together. This creates a strong hold, and a secure base for the rest of your spinning! Learning this was when the lightbulb really went on for me, the rest comes with practice and finding which kind of wool you like using best (my favorite is alpaca, mmmmm). I hope this helps someone out there get the spinning bug! It’s tons of fun once you get the hang of it, and after that, as they say, the possibilities are endless!! !